A little bit about me and my food journey: I was raised in the healthy-eating, organic-obsessed, farmer’s market-driven culture of the San Francisco Bay Area; while my husband grew up in the deep-dish pizza-loving suburbs of Chicago. My childhood was filled with fruits, vegetables and home cooked meals–I was raised to be “picky” about what I put into my body and to eat junk food in moderation. For him, ice cream and french fries were a way of life. But when we got married, the question was: What would the picky eater and her fast food husband eat for dinner? I realized that the only way I would be able to bridge the gap between my husband’s “white bread” world and my “wheat bread” world would be to cook healthy versions of foods that my husband enjoyed. And so, at the age of 24, I taught myself to cook. Gradually, I started making healthier swaps in my husband’s diet, “sneaking” in the good stuff without him noticing. Slowly but surely he began to identify different flavors like cumin, ginger, and garlic, and he even started asking for vegetables in his dishes! He said it was because he learned that healthy food could taste good, which meant the world to me. My blog was inspired by my husband’s transformation and my desire to share our experience with others. I love creating healthy versions of comfort foods – dishes that taste absolutely delicious but are actually good for you! 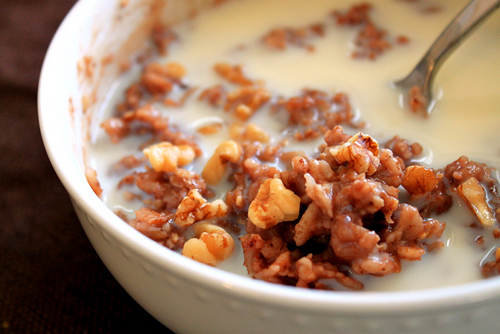 Today’s recipe is exactly that – a decadent breakfast treat: Chocolate Brownie Oatmeal. 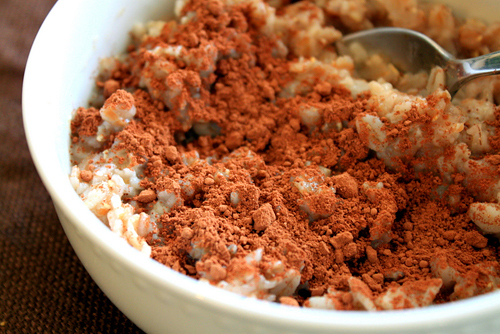 I love oatmeal, and I’m always looking for ways to spice it up to make my breakfasts more interesting and fun. I also like using oatmeal as a base to recreate some of my favorite sweet treats like Banana Bread Oatmeal and Pumpkin Pie Oatmeal. The possibilities really are endless. Here is my recipe for Chocolate Brownie Oatmeal. I promise, you will love it. It is so amazingly good, you won’t believe it’s good for you! I hope all of you enjoy this recipe! Add the Stevia, and stir to combine until the oats have the consistency you like. Enjoy the chocolatey brownie goodness of the oatmeal. Thanks so much Anjali! 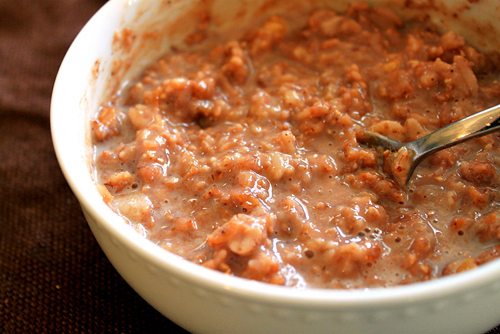 I recently made a winter squash oatmeal (recipe coming soon) that was so delicious. I can imagine this was amazing on my list to make! If you or somebody you know would like to be a part of Featured Foodie Friday please e-mail me at savourthesenses (at) gmail (dot) com and we can get you scheduled! Wow, that looks delicious!!! I’ve had a craving oatmeal for some reason lately and I’m definitely gonna use this recipe to satiate it! Now this is my kind of recipe. I love oatmeal and try different things in it. Mostly fruit. I never thought of chocolate! You’re right about food associated memories. Certain foods hold strong memories for me. Like the smell of cumin or chorizo. Takes me back to Texas immediately! Thanks so much everyone! @Kiri – I love pumpkin oatmeal too – it’s one of my favs 🙂 @pauline & @curt – hope you like it! @choc chip uru – let me know if this makes you an oatmeal convert! 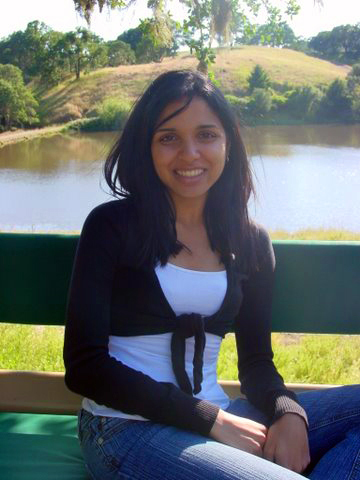 Anjali’s blog sounds like one I would LOVE! I’m the “picky eater” in a family of meat and potatoes-loving folks and I’m always looking for recipes that they’ll eat too! This oatmeal sounds amazing! Not so ridiculous really — we need food to survive, we need good food to be healthy, we need interesting food to be inspired in many ways. Air and water might need to be high on our concern list as well but for some reason we as a species like to ignore those until it close to too late. Seriously???? This looks great. Who would have thought about brownie oatmeal. This may be a way to get my husband to actually like oatmeal for breakfast. Nice narrative that accompanies this post. It’s interesting (and, I’m sure, quite a challenge) to blend two ways and styles of eating. 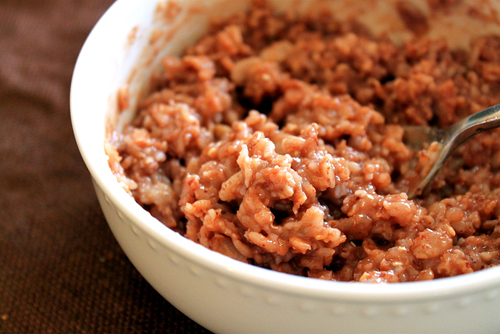 I love that your oatmeal recipe has the healthy factor and the “yum” factor going on. Thanks, too, for adding the nutritional information.